Many WCET members are involved in “reinvention” of their institutions and the change management that it implies. Project DAVID engaged leaders in liberal arts colleges in sharing their innovations. Thank you to Ann Hill Duin and Eric Childers for their work and for Ann in providing this guest blog post. Their ebook includes articles describing how these institutions are thinking about change. Even if you are not a liberal arts college, you may find these thought pieces on change helpful. What is Project DAVID, and how did it come about? It’s no secret that these are transformative times with major factors demanding increased performance and targeted outcomes. Continued success demands reinvention. Project DAVID is about showcasing strategic reinvention underway across higher education. We use a set of themes–Distinction, Analytics, Value, Innovation, and Digital opportunities (thus, DAVID)–to identify how institutions are positioning themselves for future success. The purpose is to showcase strategic reinvention underway as a means to foster conversation among institutions about the keys to their future success and the degree to which those keys are shared. Where there is no strategic reinvention, the colleges perish. Thus, this work is critical. Project DAVID builds on Eric Childers’ (2012) findings on the impact of leadership on organizational identity as described in College Identity Sagas. This research also stems from ongoing work on the criticality of shared leadership for the future of higher education (Duin & Baer, 2010), the need for transformation in an age of disruptive change (Norris et al., 2013), and the analytics, policies and politics of reinvention strategies (Baer & Duin, 2014). Ann determined the DAVID themes as part of a presidential search with a small liberal arts college, a search that reignited her vocational calling and subsequent development of this project. 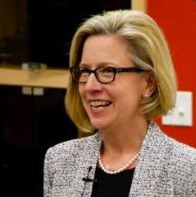 Using grounded theory methodology, throughout 2013 she visited with presidential and/or other leadership at 20 (primarily Lutheran) institutions, discerning approaches to strategic reinvention and inviting each institution’s leadership to contribute to the Project DAVID eBook. As a result, presidents, provosts, CIOs, faculty, and staff share, in this collection of 27 chapters, how they are positioning their institutions for future success. How is this set of liberal arts colleges working on strategic reinvention? President Lemons (Susquehanna University) shares about their university-wide conversation on The Future of the Academy. Instructional technologists Autumm Caines and Wen-Li Feng describe their collective leadership and the strategic role of the Learn, Share, Explore series in forging Capital University’s future. President Henning (Grand View University) writes that “the disruption that’s needed is in the way we price, package, and finance the education we provide, more so than in the delivery of education. The real issue is cost.” He shares about the impact of the Financial Empowerment Plan. Provost Ty Buckman shares how Wittenberg University’s Innovation Task Force identified themes and outcomes “indigenous” to the institution: student success programming, more robust academic advising, high impact pedagogical practices, and new ways for alumni/ae to engage in the educational mission of the university. As a number of these institutions are part of the Lutheran Educational Conference of North America (LECNA), we led a workshop on Project DAVID as part of LECNA’s annual presidential meeting in February. 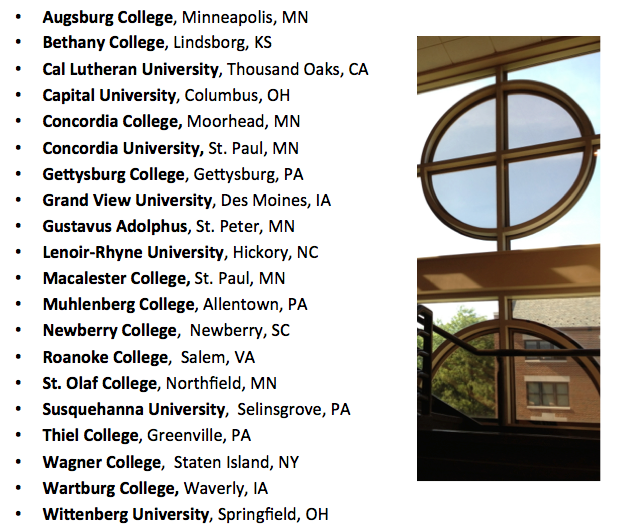 Presidents of these 40 institutions emphasized that their institutions live at the intersection of mission and market, that “The continual challenge is to pass on the core values of liberal arts education from one generation to the next in a way that is relevant to the marketplace demands of each new generation” (President Ries, Concordia University-St. Paul). Regarding strategic reinvention, the presidents emphasized the need to develop practical programs for meeting the needs of students (i.e., to redesign undergraduate programs, develop programs for a diverse market, and ensure that mission is applied to contemporary needs and issues); the importance of embracing the centrality of student success (outcomes, graduation, employment); and above all, the need to create a culture of innovation through collaboration. So, how might colleges reinvent themselves – via collaboration? While there’s interest in reinvention, and great interest in the imperative for collaboration, operationalizing these ideas is extremely difficult. Not surprisingly, we have found resistance to change, resistance to opening up the dialogue, and in some cases, resistance to the term “reinvention.” Even though institutional leadership realizes the need for reinvention and collaboration, in some sectors, there’s still resistance to talk about what to do. Despite Eugene Tobin’s (Mellon Foundation Program Officer) call that “The future of liberal arts begins with collaboration,” (2013, 133), leadership often still sees collaboration as losing power, resources, and institutional identity. Thus, reinvention and collaboration are difficult, and there is no template to follow for operationalizing such work. There are, however, a number of resources emerging to operationalize collaboration. For example, the National Institute for Technology in Liberal Education is working to design and implement a collaboration toolkit, including a workshop for the upcoming Association for Collaborative Leadership conference. Presidents, provosts, and faculty across five institutions–Concordia U Texas, Texas Lutheran, Texas Wesleyan U, Schreiner U, and Lubbock Christian U–are using an early version of this toolkit as a means to broaden foreign language offerings. Phase two of Project DAVID will include even greater focus on identity and collaboration. We welcome connecting with those institutions that are willing to engage with authentic conversation–locally and in collaboration with other institutions–regarding strategic reinvention, identity and collaboration. The remaining years of this decade will present each of our institutions with “Goliath facing” moments. We encourage you to download and use this eBook as a means to foster conversations of consequence regarding strategic reinvention and future success.